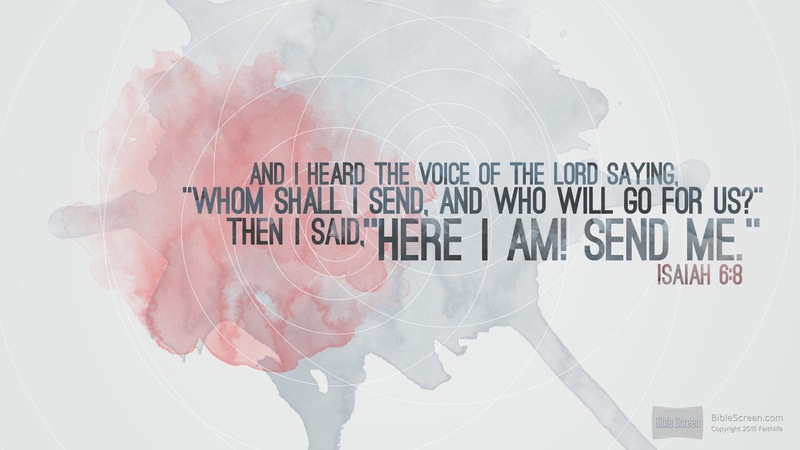 The message of God to Isaiah in vv. 9–10 is strongly predestinarian. How appropriate, therefore, that the verse preceding them should place such emphasis on the prophet’s responsibility! He is not coerced into service; rather, his will makes its ready response as a grateful reaction to God’s forgiving grace. No doubt Isaiah’s readiness was itself the product of divine grace, but this is not where the stress falls here. Instead, we see him faced with the challenge to personal commitment. The plural “us” is often linked theologically with v. 3 (see comment) and interpreted in terms of the Trinity. It is an unusual phenomenon, found elsewhere in the OT only in Genesis (Ge 1:26; 11:7; cf. also Isa 41:21–23). Many modern scholars, taking it to be a plural of consultation, see it both here and in Genesis as implying a council of heavenly beings. There are, of course, many biblical passages that picture God as surrounded by the heavenly hosts. In a context that speaks both of waters and mountains (and so of nature) and of nations (and so, by implication, also of history), however, the Lord refutes the notion that he consulted others in his work of creation (40:13–14). If Isaiah 6 and 40 have the same author (see Introduction, pp. 438–48), it seems most unlikely that consultation with a heavenly council is in view here. Moreover in Daniel, what a pagan king may have attributed to “the decree of the watchers” (Da 4:17, KJV) Daniel called “the decree of the Most High” (Da 4:24). 6:8 Us. This plural pronoun does not prove the doctrine of the Trinity, but does strongly imply it (see Ge 1:26). Here am I. Send me! This response evidenced the humble readiness of complete trust. Though profoundly aware of his sin, he was available. 6:8 Whom shall I send, and who will go for us? See 1 Kings 22:19–20; Jer. 23:18, 22. Here am I! Send me. Isaiah’s experience of grace has dealt with his problem, confessed in Isa. 6:5. “Us” is like “us” in Gen. 1:26 (“let us make man”): God could be addressing himself (in a way compatible with the Christian doctrine of the Trinity), or he could be addressing his heavenly court (less likely, since only God is doing the sending here). See notes on Gen. 1:26; 1:27. 6:8 who will go for us? The biblical descriptions of God’s heavenly deliberations often include a plural address. The plural can be understood most simply as God addressing the divine beings present in His throne room, and asking them a rhetorical question—knowing Isaiah will respond. A mark of a true prophet was that he had stood in the divine council and received his mission directly from God. See Gen 1:26 and note; Jer 23:18; 1 Kgs 22:19–23. 6:8 who will go for us. The Lord invited Isaiah to listen in on the sessions of the royal, heavenly court. From this moment on Isaiah is a servant of God’s court and proclaims God’s message to kings and people alike (cf. 1 Kin. 22:19, 20; Jer. 23:18, 22). This entry was posted in Daily Devotional Guide, Verse of the day on February 27, 2017 by Truth2Freedom.